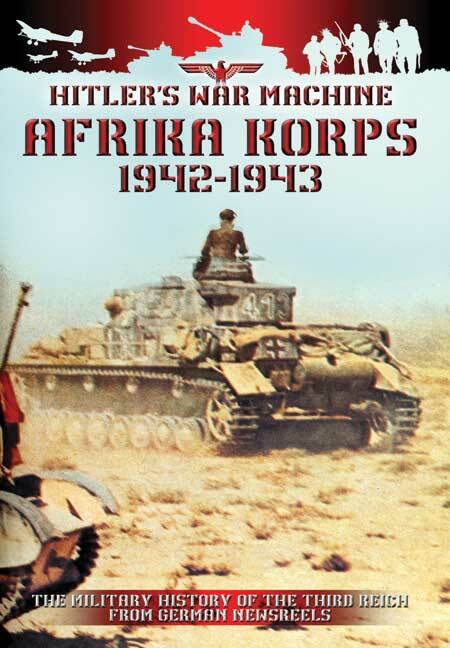 You'll be £9.99 closer to your next £10.00 credit when you purchase Afrika Korps 1942-1943. What's this? This volume features translated Wochenschau newsreels dating from 1942 into early 1943 and records the military events from Bir Hacheim to the to the retreat from the western desert and on to the final defeat in Tunisia. Consisting throughout of original German newsreel footage, this DVD follows the Afrika Korps and their Italian allies during the advance on Egypt in late 1942, and subsequent retreat into Tunisia during the following year. It begins with their great success at Gazala, using maps to explain the progress of the campaign and the defences encountered, and goes on to look at the fall of Tobruk and the retreat from El Alamein. Complete with its original, enormously biased commentary, it also makes for an interesting study in propaganda; with triumphant marching music, seemingly easy victories and doubtlessly satisfying columns of British prisoners, it proceeds with a great fanfare when the Afrika Korps was winning but is not so forthcoming during their retreat and ultimate eviction from the continent. There are several scenes of infantry and armour advancing through British artillery fire, but most of the action naturally takes place in the rear areas, around anti-tank weapons and artillery, but also shows reinforcements being flown to North Africa in Ju 52's, and supplies of all types being ferried across the Mediterranean, amongst which there is some simply stunning footage of British torpedo bombers attacking the convoys at close range.